newslatest newsImpressive event: Storytelling on your plate!? Always looking for the next way to push the envelope... Together with partner Total-e, To The Point Events from Belgium invested in an ambitious 'table mapping project'. The idea and the technology are not new, but the challenge was huge, and the way it was done simply magical. The first customer was Metrotile Europe NV, a company which does business with its heart. It was organised as a sensational, high-tech, and yet authentic party with a strong family character. The guests? An international ensemble of 300 guests from 90 countries. "In addition to a magical discovery ride with golf carts through an animated factory, the dinner was to be the ultimate experience. For this pilot project, we opted for a remarkable configuration, or 'table mapping', in one of the factory halls. 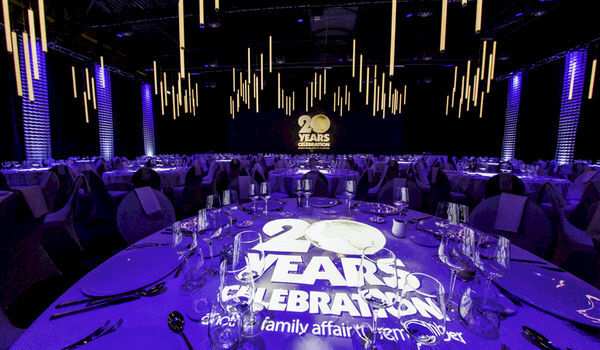 Each table was fitted with its own table projection, while there was also a large screen for all tables together. Together with the table mapping, the storytelling - based on the 4 continents - was reinforced in an orchestrated composition of seeing, hearing, feeling, smelling, and tasting. Do you want to know what the largest challenge was? Creating a balanced-out content in a fine-tuned balance between info and entertainment. Together with J&M catering a unique taste sensation was created on the very plates. And the absolute climax was the moment when all the guests - customers, suppliers, friends, and stakeholders - incited by the inspiring CEO, sang 'Imagine' together, standing up, hand in hand, as one big family. 'Imagine... and the world will live as one...'", says Bart Koninckx of To The Point Events.